Have you ever dreamed of finding a priceless antique and making a fortune selling it? Most avid collectors, to one degree or another, have had visions of these kinds of collectibles dancing in their heads. While it doesn't happen every day, those dreams of fabulous finds do come true from time to time for a few lucky individuals. Sometimes it is through diligent shopping using an eye for quality; other times it comes through inheriting something wonderful and unexpectedly valuable from a family member. Think it could never happen to you? Consider these fantastic stories before you write off the possibility of a fabulous find of your own. A CNN online article a while back exhibited the very best of collecting luck. The newsy tidbit told of a Newport, Rhode Island antiques dealer, Alan Golash, whose partner paid $14 for an enameled karat gold brooch dating to approximately 1835 he found lingering within a basket of costume jewelry in an ordinary antique shop. That's a great find in itself, but the largest gem decorating the jewelry turned out to be a rare purple Quahog pearl. This type of pearl is so elusive that a knowledgeable representative of Christie's auction house in New York reported never having seen one like it before. Some gem experts believe that because of the size of this particular pearl, 14 millimeters in diameter, it may be one of a kind. The brooch actually held two, Quahog pearls. Another smaller one dangles from the bottom as shown here. 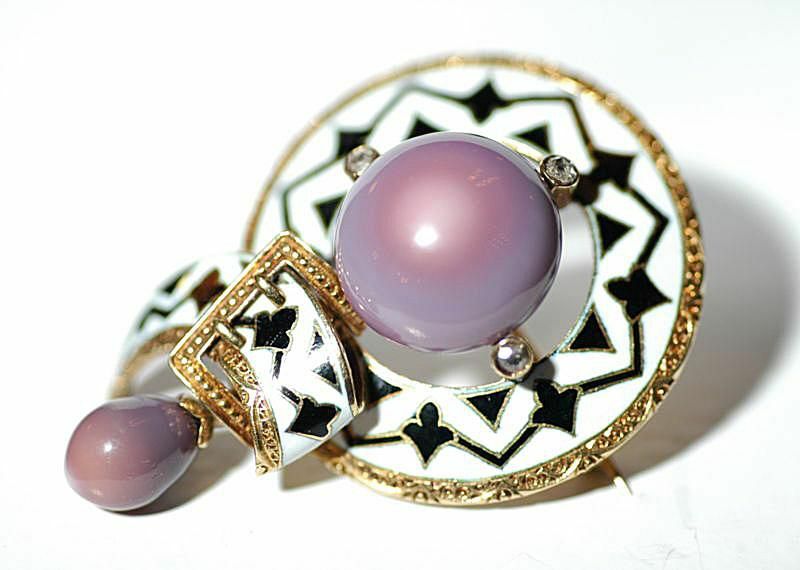 No estimate was given on the value of the brooch, but the article did say that it would eventually be sold at through an auction house in Hong Kong where pearls are highly prized. Later reports indicated that the owner was hanging on to the brooch, and no news has surfaced about a possible sale date. While it is not likely that an ordinary collector will ever score a find-lottery of that magnitude, there is a possibility to turn up a nice score on a smaller scale. It's that thrill of the hunt that keeps us motivated. Awhile back, a Northwood carnival glass plate in the Strawberry pattern was listed on eBay along with dozens of others. What made this particular piece so unusual, and valuable, was the color: ice blue. "This is one of four known plates - two have been damaged, which makes this plate the second perfect one," said glass expert Reyne Hirsch, a former Antiques Roadshow appraiser, in a related press release. As you can imagine, when a rare plate like this one suddenly comes on the market it creates quite a stir in the online glass collecting community. Word quickly spread about the plate, and when all was said and done, it topped out with a remarkably high bid of $16,327.55. While that is certainly impressive, the most significant piece of the puzzle here is that the owner, who lives in Michigan, inherited the piece from her husband's grandmother and had no clue it was extremely rare when she listed it for sale. She lucked out that it was accurately described so that ardent collectors could find it even though she had no clue about the impending value. A few months prior to the Northwood Cinderella story told above, another unsuspecting treasure made headlines on eBay. This time it was a fishing lure that reeled in big bucks. The ultra-rare Heddon fishing lure started with a bid of only $9.95 and no reserve, indicating that the Canadian seller probably did not realize it was such a valuable collectible. Bids quickly rose past the $1,000 mark and by the end of the frenzy, it topped out at an unbelievable price of $31,851.50, according to a PR Collect press release. If you did not realize that old, name brand, wooden fishing lures could be so desirable, it might be time to take a look at your grandfather's tackle box for a few treasures of your own. While most wooden lures with glass eyes aren't nearly as valuable, they can still bring several hundred dollars apiece if you have just the right ones. Of course, focusing only on the selling aspect of this story leaves out an important element. The folks spending money on these types of treasures have to really want them for a collection. In this case, the buyer likely ended up just as happy as the selling party when they added this rare specimen to their stash of old lures. Is your find of a lifetime still out there waiting for you? You'll never know until you embark on the hunt. Want to Start a Retirement Antiques Business?